Arcing, seen as sparks or flashes within the microwave oven, occurs when electromagnetic waves emitted from the magnetron during cooking strike a metallic or reflective surface. You can stop your microwave arcing by taking a look inside the oven cavity and checking for signs of trouble. The container or cookware used during cooking may also cause arcing if it is unsuitable for microwave use. 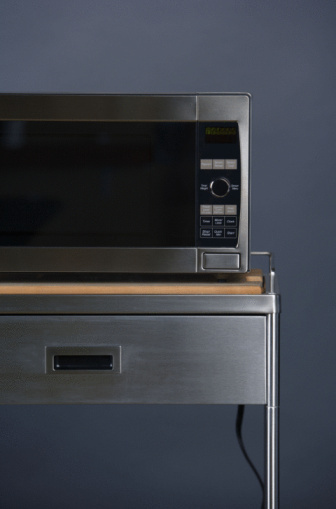 Repairing an arcing microwave involves examining and cleaning the inside of the microwave. Examine your microwave and remove the cause of arcing. Remove the plastic turntable support and glass plate from the oven. Carefully but thoroughly wipe down the inside of the microwave with a soft, soapy cloth, removing any food residue or splashes on the walls, floor and ceiling of the oven. Food stains cause arcing if left inside the oven. Wash the turntable support and plate in a sink of soapy water, removing all food residues. Dry everything and reassemble the turntable and plate. Check everything you put inside the microwave for metallic edges or trim. Never microwave anything wrapped in tin foil or with metal cutlery still inside. Arcing always occurs at the cause of the problem. If you see arcing on the side of a bowl, for example, there may be metal trim beneath the glaze. Stop the microwave as soon as you see arcing. Use a different brand of kitchen towel if you are cooking bacon or other food on tissue paper. Some recycled brands of kitchen towel contain tiny traces of metal that cause arcing when microwaved. Consider using a reusable fabric kitchen cloth when microwaving on disposable kitchen paper. Microwave one container at a time. Arcing sometimes occurs when containers or plates get too close to each other or the walls of the oven. Ensure everything you put inside the oven fits within the circumference of the cooking plate. Larger items may strike the wall during cooking and heat unevenly.